The bike was designed by Andrew Ritchie who thought he could do better than the rather rickety folding bikes around in 1975. The history of the product can be found on the Brompton website and in other places on the web but the really exceptional thing about it is the way the design appears to be completely unchanged in nearly 30 years, yet, when you look closely, almost everything about it has changed and improved many times without altering the basic proposition of the most elegant folding bike in the world. Today’s Brompton is available in a bewildering array of bespoke options that include superlightweight titanium frames, a great variety of gear systems, one of the most original and effective bike luggage systems available and lots of tiny details like hand-made Brooks leather saddles that are very popular with discerning buyers despite a hefty additional price. Many of these details of the design, like the luggage or the unique gear system, are the result of a willingness to think differently from anybody else in the business and an obsession with reliability and simplicity. Several well-known bike parts manufacturers make multispeed hub gears but they are heavy and complex so Brompton designed their own lightweight components to double the number of gears available from traditional 3-speed gears, to build a bike that will go almost anywhere but is simple, light and efficient. The Brompton fulfils a basic human need, for efficient transport, but it makes every journey fun as well. Although I’ve always had and used a bike, since owning a Brompton I am 200% fitter and I resent having to sit in a car because that’s just tedious. Now if I visit another town or city I really feel in touch with the place and if I want to be somewhere else I can be there in a flash and enjoy the experience rather than trudging on foot or waiting for public transport. My Brompton is as light as a good touring bike, as lively as a racing bike and it allows me to carry everything I need whether it’s a one-day business trip or weeks camping holiday. This entry was posted on 29 March 2009 at 8:53 pm and is filed under Products. You can follow any responses to this entry through the RSS 2.0 feed. You can leave a response, or trackback from your own site. Thank you for providing such an accurate article regarding this brilliant two wheeler – the Brompton. I bought my first one 3 years ago after suffering a series of strokes that led me to give up driving a car. I’m happy to report that I’m quite recovered now and the Brompton has given me a ‘third leg’, so versatile and practical. I use it all the time for journeys upwards to 20 miles. Superb on public transport too. I also own a ‘full size’ bike as I been a dedicated cyclist for many years, but the Brompton wins hands down as it’s such fun to ride and also has provoked many an impromptu discussion with passing folk when I’m unfolding the machine in the street! I urge anyone to buy one and enhance their life in so many ways. Glad to find you alive and well. Hi Reuben, wonderful to see you pop up here. You get a name check on my blog right here. Keep going down the page until you see a copy of your original artwork. The “last heard of” refers to a time I was staying in Boston and saw your name in the local “What’s On”, sadly it was the wrong day. Is your Spitfire a Triumph or a Supermarine? (or maybe Airfix). I know you pop stars go in for expensive toys. The old Spitty almost cost as much as the Brompton. I upgraded from a Strida a couple of years ago, big difference! 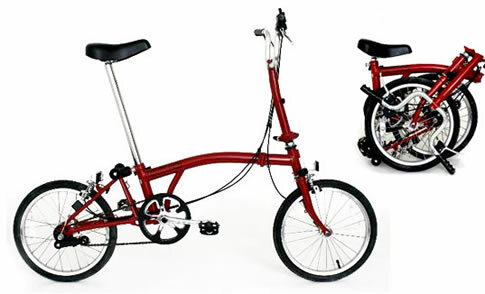 Am I the only one that doesn’t like Brompton bikes. I bought one a couple of months ago after my real bike finally expired after 15 years.. I had great hopes but ….the lights never worked, the seat constantly lowers ltself even though the holding nut is super tight and I find it unstabe and very hard work even though it has 6 gears. Of course it is beautifully engineered but a major disappointment to ride. It’s heading for eBay. Then I’m getting a proper bike. I’m sure there are others Paul. If it’s a used bike it might need a bit of work on the seatpost clamp, or an upgrade as the newer clamps are a big improvement. As for lights, I wouldn’t bother with the Brompton lights as I’m happy with basic LED battery lights for commuting but those who need lights seem to like the SON hub dynamo lighting sold with new Bromptons. Hope you find a bike to suit you. I bought a new Brompton when I retired – one of the best things I have done. I use it most days and love it. You write that the bike is life-enhancing, which it is, but for me it’s also life-affirming! I feel so happy riding my Brompton! I would love to ride a Brompton. I’m 64 and just retired. Not sure if neck and shoulder will allow me to ride! Time will tell. Nice blog! I bought my MR6 yesterday, and am waiting for the saddle proofide kit to come before I take the bike out. It is a thing of beauty, and I sit and admire the quality of workmanship. Being a man of leisure now, I have bought the bike just to have a bit of fun with, and the Brommie owner I met today, assured me that I would. Hi Mike, Proofide is good but I always carry one of those shower caps you get in hotel bedrooms, then if you have to park your bike out in the rain it’s fine. While you are riding of course it’s completely protected. You may wish to join the Bromptontalk discussion forum on Yahoo Groups. People are surprised what a friendly, helpful and polite place it is.